Created in 2006, the Serlin Trail is an MTB spot located near Grenoble, in Saint Martin le Vinoux. This local spot is managed by a bike association and is totally legal (official). 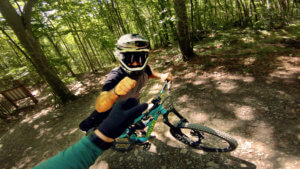 The Serlin trail has been created by a group of around 10 friends all passionate about mountain biking, who wanted to create their own bike park and do something good for the mtb community. Every rider is welcome on the spot: this only thing you need is to join the association!